The controversial Garden Bridge across the Thames should be scrapped if a capital funding gap of at least £70m cannot be filled, a highly critical independent review has recommended. The review, by Dame Margaret Hodge, found that the finances of the Garden Bridge Trust, which is responsible for the project, ‘are in a precarious state and many outstanding risks remain unresolved’. It also found that ‘there was not an open, fair and competitive process’ around the two Transport for London procurements for the project. ‘The two procurements revealed systemic failures and ineffective control systems at many levels,’ the review found. 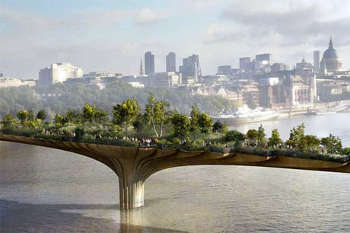 Dame Margaret said: ‘I did not seek to ask whether the concept of a garden bridge over the River Thames is a good idea. But my review has found that too many things went wrong in the development and implementation of the Garden Bridge Project. Costs have escalated from an early estimate of £60m to over £200m today and the risk to the taxpayer has intensified. The review stated that the Trust has lost two major private donors and has pledges of £69m with no new pledges secured since August. With a public sector contribution of £60m, that leaves a gap in capital funding of at least £70m. In addition, ‘very little progress has been made on raising money to fund the ongoing maintenance of a completed bridge,’ the review found. John O'Connell, chief executive of the TaxPayers' Alliance, said: 'This utterly damning report proves what campaigners have been saying about this hugely expensive vanity project all along. London mayor Sadiq Khan commissioned Dame Margaret in October to undertake the review, to assess whether value for money was being secured from the public sector contribution. It examined ‘the policies, procedures adopted to implement the Garden Bridge Project and the conduct of those involved’.